Search engine leader looks to bulk up in the burgeoning online video market. NEW YORK (CNNMoney.com) -- Google, the Internet's leading search engine, announced Monday that it is buying popular online video site YouTube for $1.65 billion in stock. YouTube, which was founded in February 2005, has quickly become the most well-known of several online video sites. More than 100 million videos, many of which are short videos created by the site's users, are downloaded a day on the site. According to Internet research firm Hitwise, YouTube has about a 46 percent share of the online video market. For Google (Charts), the purchase of YouTube gives the company the ability to tap into the potentially lucrative online video and social networking markets. Some analysts have criticized Google for relying too much on advertising tied to keyword searches. The combination of Google and YouTube could further strengthen Google's dominance in online advertising, giving it an edge over rivals such as Yahoo! (Charts), Microsoft's (Charts) MSN and News Corp (Charts)., which owns the social networking site MySpace. Some analysts said Monday that Yahoo, Microsoft and News Corp. also had probably expressed interest in buying YouTube. Bill Tancer, general manger of global research of Hitwise, said after the deal was announced that MySpace would now probably need to promote its own video service more aggressively on its site in order to compete with a combined Google-YouTube. And Martin Pyykkonen, an analyst with Global Crown Capital, said that Google's purchase of YouTube could be viewed as a preemptive strike against Yahoo, which has been rumored to be in talks to purchase social networking site Facebook. In a statement, Google said YouTube will operate as an independent unit of Google once the deal closes and will retain the YouTube brand name. The companies added that no YouTube workers will lose their jobs as a result of the acquisition and that Google will maintain its own online video business. Clayton Moran, an analyst with Stanford Group, said after the deal was announced that Google was paying a rich price for YouTube since it has yet to generate a sizable amount of sales. But he said Google needed to do something to become more competitive with MySpace, which currently ranks in second place in online video market share. "My sense is that Google is paying a full price considering that YouTube is still unproven in regards to its revenue potential. But considering the success of MySpace it was clearly worthwhile for Google to take this step," Moran said. In addition to giving Google a stronger foothold in the burgeoning social networking market, YouTube could also help Google extend its highly successful text-based search platform into video, which could wind up being even more profitable. Pyykkonen said that for this reason, Google may be able to justify paying such a high price for YouTube. "Google has talked a lot about video and video search without really having anything particularly going on there. I would think that a lot of advertisers would be willing to pay a premium for a video search ad opposed to paid search text," he said. During a conference call, Google chief executive officer Eric Schmidt said the YouTube deal would be one of "many investments" that Google planned to make in online video. He added that the combination of Google and YouTube would make Google more desirable to advertisers. "This is just the beginning of an Internet video revolution," he said. There is some debate about whether or not YouTube or other user-generated video sites will be able to attract the interest of top advertisers. But Tancer said that big corporations may be forced to start spending on ads tied to such clips. "I don't know if advertisers will have the choice going forward. They'll have to start taking risks. People more and more are going to use brands in user generated content," Tancer said. He mentioned the popularity of the so-called Diet Coke-Mentos Experiment video, a clip that featured two men creating elaborate gushers of Diet Coke by dropping Mentos candies into bottles of the soft drink. Mentos eventually wound up becoming the exclusive sponsor of the video on Revver, a privately held online video site that sells ads tied to user-generated videos. 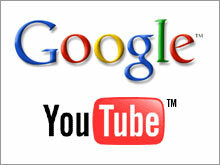 Reports of a Google-YouTube deal first began to circulate on Friday. Shares of Google rose about 2 percent on the Nasdaq Monday after posting a similar gain on Friday. The stock edged slightly higher in after hours trading. Before the deal was announced, some analysts expressed concerns about the litigation risks involved with YouTube since some videos posted on the site infringe on copyrighted material owned by major traditional media firms. To that end, YouTube truly became a part of the pop culture lexicon earlier this year after people started posting pirated versions of "Lazy Sunday," a skit on NBC's sketch comedy show "Saturday Night Live" on the site. NBC eventually forced YouTube to take down links to this clip. But Chad Hurley, co-founder and CEO of YouTube, said the Google deal will allow YouTube to focus even more on copyright protection since Google has more financial and technological resources to dedicate to the issue. However, more and more media companies have recently begun to partner with YouTube. In fact, NBC announced a partnership with YouTube earlier this summer to promote shows from its new fall schedule on the site. And on Monday, YouTube announced separate agreements with broadcast firm CBS (Charts) and music companies Sony BMG Entertainment and Universal Music Group to show video from these companies libraries. CBS and Sony BMG will share advertising revenue with YouTube. Terms of the Universal deal were not disclosed. Google also announced an online video deal with Sony BMG Monday as well as one with Warner Music Group. Is Facebook worth a billion bucks? Analysts quoted in this story do not own shares of Google and their firms have no investment banking ties to the company.